The Mississippi Delta has always been “fertile ground” for producing great blues artists, the latest edition being Morris Cummings from Clarksdale, Mississippi. Morris states honestly, “My life has been hard since I was born. Because I was blind, I was taken from my family and put in an institution when I was four years old. I only got to be with my family two or three times a year, and I was there for ten years.” Morris comes from a talented lineage. His cousins, Robert and Mary Diggs, led the famed Memphis Sheiks, and his Aunt Mary Tanner played with the ‘Harps of Melody’. Morris is also a cousin of the late, great Willie Dixon. Blind since age 4, Morris is the very embodiment of the Delta Bluesman. Morris’ band, The Pocket Rockets, is a mixture of some of the best performers and songwriters in the blues world today. The Pocket Rockets’ seasoned experience lends them the ability to mix the blues recipe of the old Memphis traditional sounds to the newer versions of today without compromising their Delta influences. Morris, along with the musicians of The Pocket Rockets are highly skilled masters in their fields, and united in this group they produce an explosive array of musicianship and song writing talents. Brad Webb serves as guitarist and band leader, Dan Cochran is on bass, Tony Adams on drums, and Russell Wheeler on piano and Hammond organ. Blind Mississippi Morris has been called ‘a new disciple of the Delta’ and the ‘Real Deal on Beale’ and he was rated one of the 10 best harmonica players in the world by Bluzharp Magazine. “Morris sings as if he’s inherited the Delta mantle from a century’s worth of legends.”Review of “Back Porch Blues” by Bill Ellis, The Commercial Appeal. 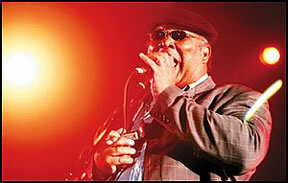 Born in Clarksdale, Mississippi, Morris Cummings comes from a talented lineage. His cousins, Robert and Mary Diggs, led the famed Memphis Shieks, and his Aunt Mary Tanner played with the ‘Harps of Melody’. Morris is also a cousin of the late, great Willie Dixon. Blind since age 4, Morris is the very embodiment of the Delta Bluesman. He has been called ‘a new disciple of the Delta’ and the ‘Real Deal on Beale’ and, he was rated one of the 10 best harmonica players in the world by Bluzharp Magazine. Morris is backed up by The Pocket Rockets, one of the hottest and best bands in Memphis. He is also available as a ‘Back Porch Duo’ with premier guitar and amp technician, Brad Webb. Brad is also a song writer, producer, engineer and is widely recognized in studio circles. He has worked with legends like Luther Allison, Coco Montoya and Billy Gibbons in top studios such as Ardent, House of Blues and others. Their collective efforts can be heard on their latest CD “Back Porch Blues”. “This is Memphis Blues at it’s finest. A powerhouse of an album.” Bill Ellis, The Commercial Appeal. Blind Mississippi Morris Cummings has come back to his old hometown of Clarksdale to have his face cast in dental plaster for a bronze sculpture. It’s Dec. 4, 2002, and the blues harmonica player known as “the Real Deal on Beale,” with four CDs and another European tour booked, is being immortalized for the ages. In passing, he mentions he’s considering a name change if eye surgeons are able to provide sight to a sickly right eye blinded by glaucoma since age 4. The left eye is probably a lost cause. He’ll become `Used to Be Blind’ Mississippi Morris, he jokes. “They’re saying, hey, I’ve got a good chance of seeing again,” he says. This is a story about a blind man who may one day see. Born into poverty then slowly losing vision, Blind Mississippi Morris Cummings has risen to international celebrity as a blues harmonica player . . . a blind blues harmonica player. The Commercial Appeal has followed his progress for eight months, as Cummings awaits his chance to recast his carefully crafted image and remake his life. At 48, Morris Cummings accommodates himself to blindness and a lifetime of disappointments with an agreeable nature that finds humor in adversity and patience in long waits. A complex set of motivations has prompted him to try once more to have his sight restored. One is his 12-year-old son Eurice, who lives with his dad. And Cummings, a regular in the Beale Street Music Festival blues tent and on European blues stages, would like to bask in the limelight before an adoring crowd of fans he can both hear and see. An effort seven years ago to transplant a clear cornea, or lens, into his right eye seemed to work, but only briefly. A jolt to his special safety glasses while riding the bus resulted in a hemorrhage, and the tunnel of light perception he’d acquired slowly dimmed, then went out. “If you’ve ever seen at all, you know what doing without is,” he says. Doing without has been a way of life for Morris Cummings. Less than a week before Cummings was scheduled to leave for a 12-day tour of blues clubs in England, he lost his house on May Street in North Memphis to foreclosure. He had three days to pack up and leave. Morris’s housing setback fits a history of losses that includes 12 ex-wives, a pending divorce, 12 children, past trouble with police and two recent bankruptcies. Blindness, for Cummings, can sometimes seem like the 60-cycle hum of a floor amplifier, just the background noise. Cummings turns his Harrah’s baseball cap backwards and settles his chin on the examination slit-lamp scope. It’s January and a nurse in Dr. Peter A. Netland’s Madison Avenue office shines a flashlight directly into his cloudy right eye and asks if he perceives a break in his darkness. Blindness, one learns after spending long hours with Cummings, is a relative thing. He can perceive very bright light, but can’t “see’ objects unless they’re brushing his eyelashes, and then only as shadowy blurs. He can’t count fingers or recognize a face. He’s a big guy – 6-1, 260 pounds – and overcompensates for blindness with a phenomenal dexterity and, of course, an acute sense of sound. During an office visit on Jan. 29, Netland, one of the nation’s foremost authorities on glaucoma, suggests that Cummings undergo a regimen of treatment, including the placement of a quarter-sized valve on the outside of his eyeball, to relieve the internal pressure that is the signal symptom, besides blindness, of the disease. Once the pressure is down sufficiently, he can undergo another cornea transplant, let light filter through to his retina, and perhaps see. Cummings’s is a complicated case, and Netland, director of the University of Tennessee’s Glaucoma Service, wants to deal with it aggressively. The prognosis that he will regain some vision is uncertain, but good. Cummings can expect setbacks, Netland tells him. Blind Mississippi Morris is eager to get started. April 6, 1955, was a stormy day in Clarksdale, with baseball-sized hail. Cummings came into the world at his uncle’s home on Adams Street – his mother’s fifth child and his father’s ninth. The midwife didn’t find his twin sister until it was too late. He says he sometimes senses her presence. Before he began to lose his sight, he remembers wandering Clarksdale’s neighborhood on the south side of what tourism promoters now call Blues Alley. He lived at 360 Issaquena Street. Not 100 yards from Morris’s old apartment building, an historic marker tells that W. C. Handy lived at 317 Issaquena from 1903 to 1905. The old railroad depot where farm hands like McKinley Morganfield, a k a Muddy Waters, left the Delta for Chicago, and its freight depot, now the Delta Blues Museum, are a stone’s throw from Cummings’s old front door. Across the hall in Cummings’s apartment building, blues immortal Chester Burnett, known to local kids as Big Foot Chester but to the world as Howlin’ Wolf, sometimes blew in from Chicago to visit his mother. He’d hand out cash to the urchins like Cummings in his path. Only one business still operates on Issaquena south of the railroad viaduct. The rest are smashed shells, or swept away entirely. But the history is still here, celebrated in the world-renowned museum. Morris bought his first harmonica on Issaquena Street. He’d heard his uncles play and he was a quick study. Before long, he’d sit on the street curb and play what he heard on the radio. Sometimes Morris would tune in to AM 1510 in faraway Nashville to hear the rhythm and blues line up on WLAC. The station was famous for its offer to mail out live yellow chicks, and Morris’s parents wrote away for some. A lasting memory of being slightly sighted is seeing the fuzzy creatures pecking at his feet. He was 4 or 5 years old. For music closer to home, Clarksdale’s legendary “Soul Man” Early Wright worked out of the studio of WROX 1450-AM just down the street, and let locals sit in as an audience for some live shows around a big white upright piano. Cummings got to hear local, soon-to-be-national, gospel, rhythm and blues and soul legends like The Mighty Clouds of Joy, The Pilgrim Travelers, Sam Cooke, Curtis Mayfield and Bobby Womack. Like most of his neighbors, the family lived on welfare. “My parents had one bed and all the children slept on that bed, and those that didn’t fit on there slept on the floor,’ he recalled. A woman named Clara who flipped hamburgers at the local cafe was one of the first outsiders to notice his growing blindness. She called him `Fish-eye’. Soon thereafter, at 5, he was taken to the doctor, who diagnosed his congenital glaucoma. Records from the then-segregated Mississippi School for the Blind in Jackson show he entered the first grade in 1960 and left after 10th grade, in 1972. For a child with congenital glaucoma, institutionalization was the standard of care in the early 1960s, said Netland, who is also a professor of ophthalmology at the University of Tennessee Medical School. Unlike today, Netland says, a congenital glaucoma diagnosis back then was a permanent exile from the land of the sighted. Considering the alternatives back home in Coahoma County, the state’s recognition of its obligation to kids like Cummings was clearly a godsend. At school, Morris joined the band, playing trumpet. “It was a way to get off campus, and it gave you a little headway with the babes,” he says. Cummings transferred back and forth from the Jackson school for the blind to school in Memphis. He recalls spending second grade at Georgia Avenue Elementary and ninth grade at Porter Junior High, where classes in Braille were offered. He finished up high school at the venerable Illinois School for the Visually Impaired, founded in the 1840s, in Jacksonville, Ill. He studied music and business law for a while at Northeast Missouri State University in Kirksville. Besides the disability check, he earned money fixing and reselling small appliances. From an early age, in the summers, he accompanied his aunt and uncle, both blind, down to Beale Street, where they sold razor blades, shoelaces, chewing gum and pencils for donations that passersby tossed into their tin cups. Cummings did his share of panhandling, too. Back then, Beale had character. In the 1980s, artists like Cummings had solo acts on the street corners of Beale. University of Memphis professor and Grammy Award-winning scholar David Evans remembered seeing Cummings and thinking he needed a band to back him up. Cummings has an encyclopedic memory for songs, and not just blues tunes. His radio was tuned to the soundtrack of life in the ’60s, ’70s and ’80s, and stereo components dominate his living room. He might not recognize Jimi Hendrix from a picture, but he’d know him after a few notes. He plays a mean guitar in his own right. Records of the Memphis Police Department indicate Cummings earned a reputation as a big man who could fend for himself, despite his blindness. In 1974, at age 19, he was arrested on Hickory Street when police saw a chrome-plated 22 pistol in his waistband. “Over there, you’d better carry a gun,’ he says with a shrug. Asked as a practical matter what a blind man does with a pistol, Cummings said he could aim by ear. Living in a blighted section of East St. Louis, Ill., with his mother and sisters in the late 70’s, he met his first wife. Karen Davenport was just a teenager. Her white parents were scandalized. The young couple’s daughter Marla Cummings, now of Daly City, Calif., was born in Jacksonville, Ill., and a premature child was born and died there. Cummings is a little vague about how he came to meet and marry women named Sheila, Bobbie Jean, Della, Carol, Cynthia, Andrea and others, and how he came to be a noncustodial father to 11 of his 12 children. But he can recall their names and dates of birth, and grows wistful at romantic memories. He speaks with deep regret that he’s lost track of much of that family. Cummings filed for his most recent divorce on April 23. It was uncontested. He lives with 12-year-old Eurice, a son from two wives back, near Kingsbury Middle School at the home of his fiancee Melody Methenia. Eurice is a practical joker, sometimes sneaking up behind his father and silently touching him to make him jump. Cummings says that seeing might make him a better father, or at least a more attentive one. Eurice is respectful with his “Yes, sirs,’ and dutiful, extending an arm to shepherd his dad. But he’s also busy being a kid, and asks a stranger to toss him football passes. “My dad can’t,” he says. Cummings is painfully conscious of what a burden he is to others. He said he’s always kept abreast of procedures available to eye doctors, recalling a Popular Mechanics article in Braille about new appliances being used to reverse degenerative blindness.